Publimetro: Destroyer USS Barry and USS Nimitz carrier group rerouted for possible Syria help. 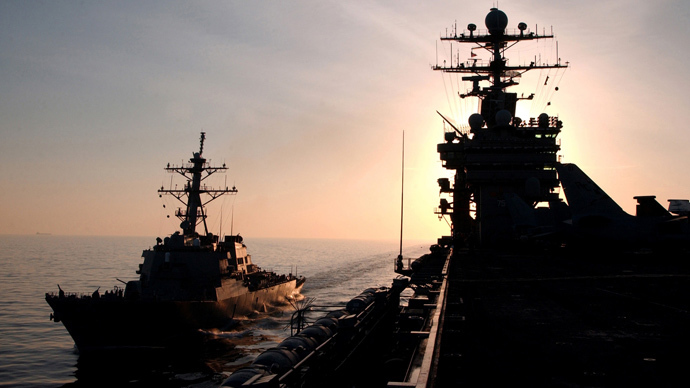 Destroyer USS Barry and USS Nimitz carrier group rerouted for possible Syria help. The Nimitz carrier strike group is moving west in the Arabian Sea should it be required to assist with an attack on Syria. WASHINGTON — The nuclear-powered aircraft carrier USS Nimitz and other ships in its strike group are heading west toward the Red Sea to help support a limited U.S. strike on Syria, if needed, defense officials said on Sunday. The Nimitz carrier strike group, which includes four destroyers and a cruiser, has no specific orders to move to the eastern Mediterranean at this point, but is moving west in the Arabian Sea so it can do so if asked. "It's about leveraging the assets to have them in place should the capabilities of the carrier strike group and the presence be needed," said the official. "We try to reduce the physics of time and space so we can be as ready as possible should we be needed," said a second official, cautioning that decisions about ship positioning in the Mediterranean were still being finalized. President Barack Obama on Saturday delayed imminent cruise missile strikes by five destroyers off the coast of Syria until Congress had time to debate the issue, effectively putting any military action on hold for at least nine days. The delay gives military planners more time to reassess which ships and other weapons will be kept in the region — and which may be swapped out — before the military launches what defense officials say is still intended to be a limited and narrowly targeted attack on Syria. The U.S. Navy doubled its presence in the eastern Mediterranean over the past week, effectively adding two destroyers to the three that generally patrol the region. The destroyers are carrying a combined load of about 200 Tomahawk missiles, but officials say a limited strike on Syria could be accomplished with half that number. 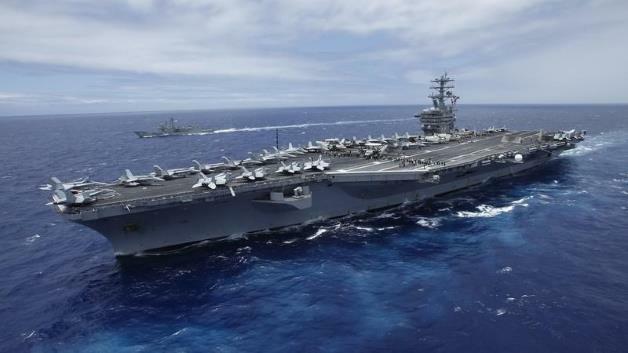 The Nimitz carrier group had been in the Indian Ocean supporting U.S. operations in Afghanistan but was due to sail east around Asia to return to its home port in Everett, Wash., after being relieved in recent days by another aircraft carrier, the USS Harry S. Truman. The Navy has also sent the USS San Antonio, an amphibious ship carrying 300 Marines and extensive communications equipment, to join the destroyers, diverting it from a different mission that would have taken it farther west. A second official said the San Antonio could serve as an afloat forward staging base, providing a temporary base for special operations forces, if they were needed. It could also assist with non-military evacuations. A spokesman for the ship declined comment, referring questions to the Navy. Lieutenant Adam Cole, spokesman for the Navy's European headquarters, declined to discuss any specific plans for the San Antonio or future ship movements. Decisions about Navy ship positioning will be made in coming days, based on military needs, maintenance issues and staffing requirements, officials said, noting that the delay in a strike on Syria had sent planners back to the drawing board. The USS Kearsarge, a large-deck amphibious assault ship that is part of a readiness group with the San Antonio, is also on the way toward the Red Sea after a port call in the United Arab Emirates, officials said. No further specific orders had been issued to the ship, they said.